Home to a sun bird totem dating back more than 3,000 years, the Du jiangyan Irrigation System built over 2,000 years ago, and jiaozi, the world's earliest paper currency invented 1,000 years ago, the Sichuan capital Chengdu can lay claim to centuries of innovation and creativity. Now, as it emerges as a world culture city, Chengdu is bringing about yet another turning point in its creative history. Located in Qingyang district of Chengdu, the Shaocheng Audio-Vision Cultural Industrial Park gets busy on weekends and holidays. It's the site of the Shaocheng music market, where people gather to take part in making original music and creative handicrafts and to enjoy the park's cultural and creative facilities. "Originality is the most characteristic feature here," said a staff member of the market's organizer. According to him, the Shaocheng music market attracts Chengdu handicraft artists with an original spirit, along with cultural and creative startup teams with traditional artworks including painting and sculpture. It provides a platform where craftsmen can present their work, communicate and exchange ideas. "We are combining cultural, creative activities and community life by organizing the music market and bringing more competitive and attractive cultural and creative products closer to our citizens," he said. The Shaocheng music market invites original musicians to stage live shows that allow Chengdu residents to enrich their cultural lives in their spare time. "We are planning different themes for each month's market. If this month's theme is music, then next month maybe we will organize an art-themed market to exhibit local artworks, or we may plan a film theme and show movies," he said. The Shaocheng Audio-Vision Cultural Industrial Park opened last year covering an area of 0.93 hectares. It houses 11 buildings, each between 300 square meters and 8,000 square meters. Many popular cultural and creative institutions, such as the Bougainvillea Music Festival, WE plus, Ciwen Media and Rongbaozhai Cafe & Bookstore, have a presence in the park. The park specializes in the film, music and digital entertainment industries and has a vision of becoming a new urban reception room while maintaining the traditions of Chengdu. The operator of the industrial park said, "We are bringing in upstream and downstream industries, and building a comprehensive high-end industrial ecosphere of audio-visual industries, entertainment and innovation which combines investment and financing, film and television production, publishing, promotion, talent training, derivative development and supporting services." The park's operator added it aims to create a complete chain of functions, a reasonable industrial layout, and a prominent agglomeration effect in three years, and to become the national model for industrial parks for the audio-visual, entertainment and creative industries in eight years. The Shaocheng Audio-Vision Cultural Industrial Park is a leading representative of Chengdu's cultural industry parks. At a convention in September, where the city's goal of becoming a world culture city was put forward, 31 companies including MintownStudioCommunity, Chengdu Xicun Cultural and Creative Industrial Park, Redstar 35 Creative Industry Park and Blueroof Art Zone pledged to open operations there. "We used to look around for new projects, but now projects are continuously coming to us," said Yu Kan, CEO of MintownStudioCommunity. He said Chengdu's efforts to become a world culture city are providing more opportunities for small scale cultural and creative business incubators such as MintownStudioCommunity. During the September convention, the organizing committee proposed combining the cultural and creative industry with the city's positive lifestyle and infusing culture and creativity, leisure and aesthetics into all aspects of people's daily lives - from food, clothing, housing and transportation to travelling, shopping and entertainment - using creativity to show the elegance of the city. MintownStudioCommunity, a cultural and creative industry platform specializing in the culture of Chengdu, is investing in, cooperating with and operating more than 200 small cultural and creative startup teams or projects each year. It has organized more than 150 cultural and creative events, and attracted more than 1,000 domestic and international professionals. MintownStudioCommunity has built up a cultural ecosphere of live art, independent bookstores, office and coffee spaces, cultural salons, film screenings, theater performances, street music and food. According to the city, culture and creativity not only fit its public image but also blend with its economic development. The organizing of an international intangible cultural heritage festival, a creative design week and an international fashion film festival, as well as an international poetry week, international bookstore forum and a China internet audio-visual conference has enhanced the international influence of Chengdu's cultural and creative brands. An important exploration of Chengdu's cultural and creative character, the fifth Chengdu Creativity and Design Week will be held from Friday to Monday. It will feature three major events - the 2018 Golden Panda Creative Design Awards, the fifth Chengdu Creative Industry Expo and the iF Chengdu International Design Forum. During the week, more than 1,000 creative or design institutions from more than 30 countries and regions including Germany, Italy, Denmark, Israel, Canada and Japan will exhibit over 23,000 creative designs. Chengdu has formed its unique path by joining culture and creativity with business, civic development, industry and travel. Last August, during a Sichuan-Hong Kong-Macao cooperation Week in Hong Kong, Chengdu held a promotional event for the construction of a Western cultural and innovation center. The event attracted 14 projects worth a total of $19.6 billion. 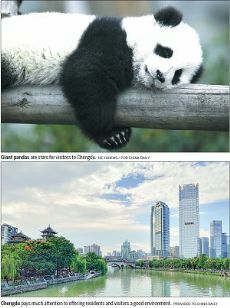 In February, Chengdu released a five-year action plan for the center's construction. By 2022, Chengdu aims to establish more national culture and creativity brands, cultural landmarks, and internationally influential industrial parks, and achieve an annual added value for the cultural and creative industry surpassing 260 billion yuan ($37.7 billion). To accelerate its emergence as a national cultural and creative center, Chengdu has planned and will carry out 437 key projects with an estimated total investment of 1.1 trillion yuan. According to data released by news service Toutiao in 2017, Chengdu's culture and creativity has attracted more than 3 billion visits online, ranking third behind Beijing and Shanghai. In July, Tencent Research and the Standard Ranking City Research Institute co-released China City's New Cultural and Creative Vitality Ranking, the first review of cities across the country in the cultural and creative fields, with Chengdu ranked No 1 among the 100 cities listed.